Erin Lombardo is the co-owner of V Power Yoga, located in Downtown Columbus. We first mentioned her in our Tour of Columbus studio spotlight, back in 2014 and highlighted her again last year, naming her one of our Top Columbus Fitness Inspirations. Erin is like my soul sister, loving so many things that I love including running & yoga, traveling, the beach and of course, chocolate. She is a fellow entrepreneur, with tons of ambition, all driven by her passion to help others become better yogis and better humans. I was super excited to meet her for a run chat a few weeks ago to pick her brain about running, yoga and more. Erin initially got into yoga as a cross training activity for her running routine. After falling in love with it, she decided to pursue her yoga teacher training certification. Flash forward a few years and this runner turned yogi found herself the proud co-owner of V Power Yoga Studio. As an instructor, she runs her classes in a way that any runner-yogi would love, an athletic blend combining both a faster vinyasa flow to elevate the heart (gotta get that cardio in!) along with poses & sequences that incorporate balance, strength and flexibility helpful as cross training. Erin also loves to let us “play” during class and has personally helped me strengthen crow, side crow, headstand and many other arm balances & inversions. While working in medical sales in San Diego, I saw the impact of an unhealthy lifestyle and wanted to be on the other side of the sale, helping people live a healthy lifestyle. This journey has truly changed my life in a way I never would’ve imagined. First, prompting my return to school in pursuit of a Masters in Nutrition along with becoming both a Registered Dietitian (RD) and Registered Yoga Teacher (RYT-200). For my Masters Thesis, I combined my passions of nutrition and yoga through an obesity and stress prevention program for 3rd graders. Through my MPH and PhD I’ve had the opportunity to work with nutrition clinical trials truly testing the potential for food as medicine. Along the way I’ve worked with individuals and groups of 400+, taught classes & workshops, led an international yoga retreat and so much more! Things I never would’ve imagined when I decided to return to the classroom to learn how to help others live a healthy lifestyle. I’m beyond excited to share my passions and expertise with others through V Power Yoga’s Teacher Training program launching October 1st. What is a favorite or fond FITness memory or accomplishment you have? There are SO many from my first half marathon to scuba diving the Great Barrier Reef! One of my fondest yoga accomplishments is handstand. When I started yoga I was absolutely terrified of inversions, specifically handstand, and now they are my favorite because they allow me to truly quiet my mind. I absolutely love working with yogis to tap into their inner strength and turn their worlds upside down. What is your go-to post-run routine? I usually walk the last half mile of a run to allow my body to cool down. Some good post-run stretches include runner’s lunge, forward fold (seated or standing), happy baby and variations of side angle & triangle. Favorite FIT place around Columbus: V Power Yoga, of course! I also like the running trails around Columbus, including the Olentangy Trail (where we met for our run chat)! 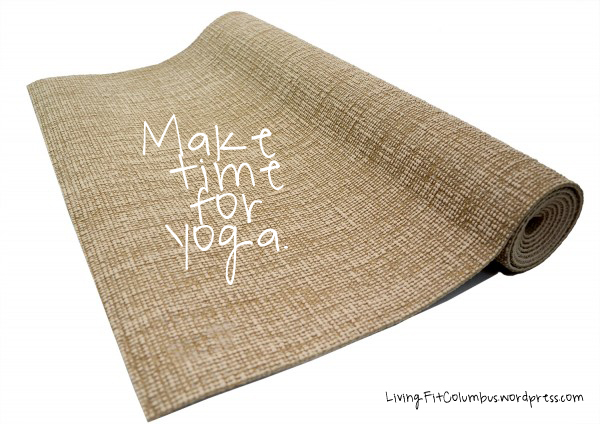 Typical weekly workout routine: I teach yoga at the studio, usually around eight classes per week. I also run two-three days per week, around 3-4 miles and take one or two yoga classes, usually at our studio.. And when it’s cold out, I hop on the elliptical instead of running outside. Favorite race distance: When I was running more, the half marathon was my favorite distance. It was achievable, yet still challenging. For purposes of having a work/life balance, I try to keep my workouts (including drive time) to two hours, so the training for the half distance fits into my lifestyle more than the full marathon distance. Favorite yoga pose or sequence: I really enjoy arm balances and inversions, and enjoy working those into my classes. I love the sense of empowerment & strength yoga can provide. Favorite treat: I love chocolate! In High School and College I spent my summers just outside Jackson Hole, WY exercising horses. My days were filled with exploring this gorgeous part of the country by foot, mountain bike, kayak and horseback! When going to a coffee shop, what is your go-to order? We have a lot of coffee meet ups. 🙂 So… I don’t do coffee! I tried coffee ice cream when I was a kid and haven’t had any sort of coffee since. My go-to drink is tea, usually chamomile lavender. ← Finding your next race… or maybe your first!